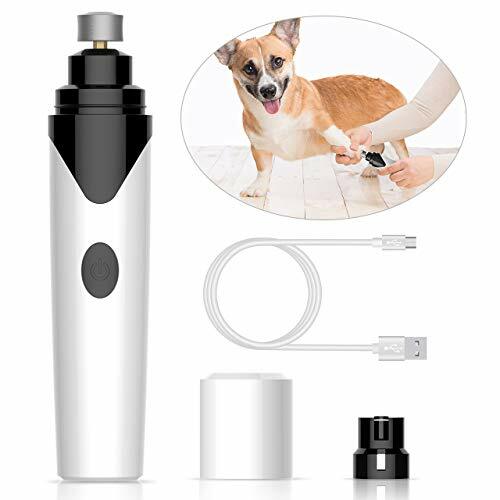 LOW NOISE& LOW VIBRATION -This dog nail grinder is especially designed with Super mute motor,the noise when operating is within the 55db,will not scare your pets when trimming their nails. ONLY FOR SMALL & MEDIUM PETS - Choose the suitable port for your pet based on the pet's size and characteristics of their nails.Especially suitable for small and medium sized pets,not for large dogs. DURABLE & POWERFUL - Made of high quality thick diamond bit grinder,ensure the dog nail grinder more durable and last longer. The motor is powerful enough to trim your pets' nail in a short time. USB RECHARGEABLE - Rechargeable by USB with indicator light, make it more convenient,without changing batteries. In general, this nail trimmer can be used for about 5 hours after 2 hours of fully charging. SAFE & EFFECTIVE -The dog nail grinder offers an new way to keep your pet's nails neat and trim., which is safer than nail clipper to trim pet nails, reducing the risk of clipping the claws too short or hurt pets. If you have any questions about this product by oneisall, contact us by completing and submitting the form below. If you are looking for a specif part number, please include it with your message.